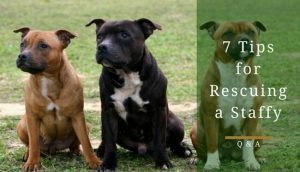 With staffies being the notorious faster eaters that they are, us owners are often looking for ways to slow down their pup’s eating. It isn’t just staffy owners in this struggle; numerous dog breeds are known to almost inhale their food. Pet product manufacturers are taking note of this need among dog owners and have begun making slow feeder bowls. However, as with the majority of pet products, an overwhelming number of different types of slow feed dog bowls have become available, which makes it hard to separate the high-quality ones from the low-quality ones. 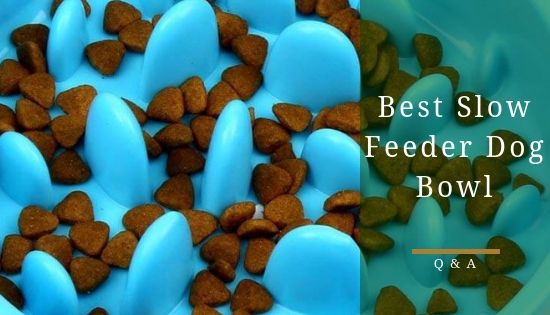 And that’s where this article comes in as we’ve done the necessary research for you and have identified what we feel are the three best slow feeder bowls on the market that any staffy owner could benefit from purchasing. In this article you will discover exactly what you need to look for when purchasing a slow feed dog bowl as well as our set of recommendations for you to choose from. What is a Slow Feeder Dog Bowl for? Simply, as the name suggests, it forces your dog to eat their food more slowly. 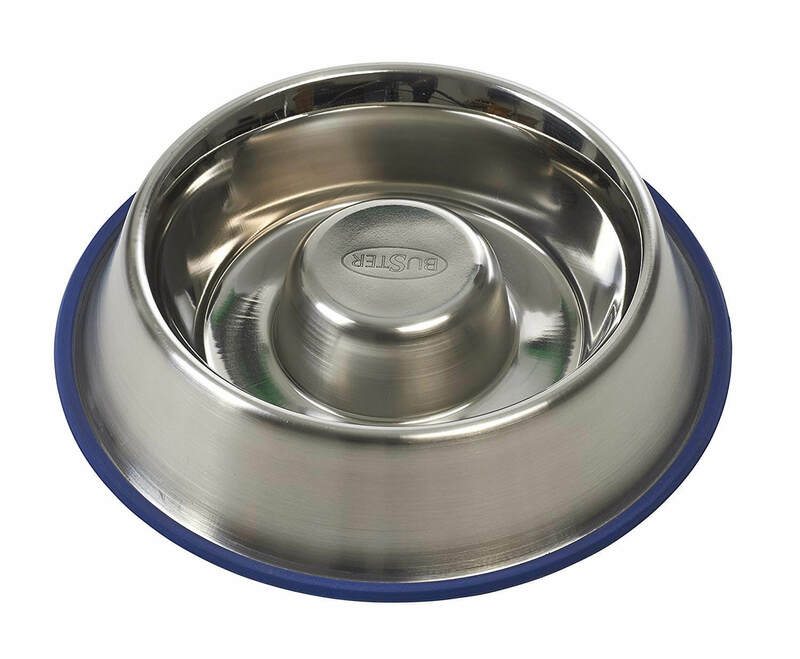 The typical dog food bowl comes with a natural access point for your dog’s food: a large space in the middle of the bowl. With this type of bowl, there’s nothing to stop your staffy from gobbling up all their food in mere minutes. On the other hand, a slower feeder bowl comes with ridges or valleys that break up the food bowl into various feeding areas. 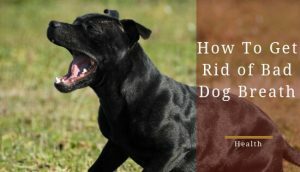 These ridges or valleys are explicitly designed to slow dog your dog’s gulping, which helps prevent conditions such as: bloating, indigestion, or other conditions caused by eating too fast. Dogs have to work around these ridges and valleys to get their food. In doing so, it provides both nutritional value and exercises their mind a bit at the same time. It’s essentially making them work for their food. 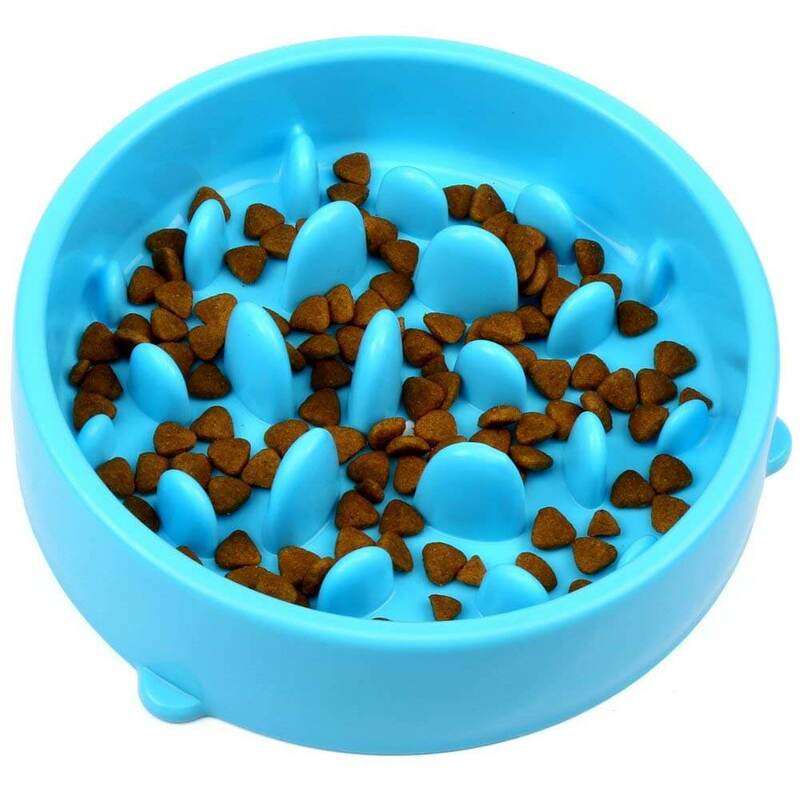 The effectiveness of slow feeder bowls is directly connected to the complexity of these ridges and valleys; the more complicated the design, the slower your dog's food will go down and less likely they'll be to suffer from bloating or other problems. Given this knowledge, it shouldn’t be a surprise that I’d recommend looking for the most complex design possible. 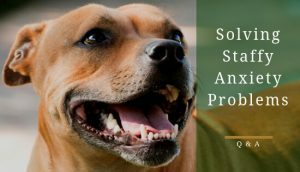 After all, eating too fast is a real problem for staffies and finding an effective way to counteract could be essential for keeping your pup healthy and happy. The main reason to use a slow feeder bowl is because staffies are prone to gulping down their food at considerable speeds. You’re probably asking why this issue raises such a concern? Well, when dogs and other pets (humans too, actually) eat their food very quickly, they’re not only swallowing their food; they’re also swallowing air with each gulp. This air mixes with the food and other compounds inside your dog, which then can expand your staffy’s stomach. Of course, nothing good comes out of your dog’s stomach expanding. It leads to a condition called gastric dilatation, which as the stomach continues expanding causes a severe medical emergency called volvulus. Volvulus is when the stomach expands so much that it will eventually start to twist on its axis. The twisting makes it much harder for anything such as blood to pass through the stomach, which causes a heap of issues. 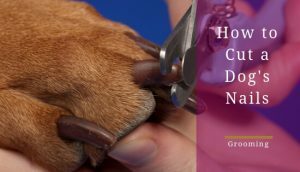 For instance, if your staffy’s blood support is cut off, it could go into shock and eventually lose its life unless surgery is performed immediately. And sadly, volvulus isn’t the only issue that can arise from your staffy eating too fast. It can also cause gagging and choking, which is a result of your dog not chewing their food properly. Even if it doesn’t make them gag or choke, the rapid eating could lead them to suffer indigestion as the food hasn’t been broken down properly in their mouth. As you can see, finding a way to slow down your dog’s eating habits could be very important for a staffy owner. This isn’t something you want to sweep under the rug. These conditions can be severely uncomfortable, and you should try anything you can to avoid them from affecting your dog. 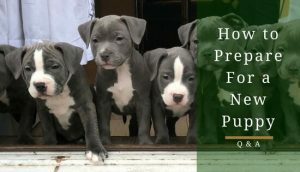 Now that I’ve proven why a slow feeder bowl is a must-have purchase for a staffy owner; we must go over the things you’ll need to keep in my mind during your search for the best slow feeder bowl. The bowl’s design is the most important thing you must consider when searching for a slow feeder bowl. After all, if the design isn’t up to par, the whole purpose of the slow feeder bowl will end up being useless. With this in mind, it’s essential you remember that the more complicated the design, the slower your dog will intake food. The key is finding something that’s difficult enough to slow down your dog’s eating. I’d recommend trying to find something that’ll extend your dog’s eating time a few minutes rather than an overly-extended period. For instance, if your staffy usually gobbles their food up in two minutes, find something that’ll extend their feeding time to five or 10 minutes. 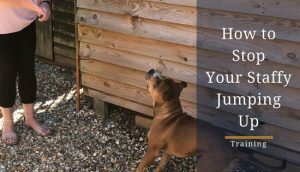 If you get a design that ends up too complicated, your staffy might end up getting bored and move onto chewing something else; not an ideal outcome and could be hazardous to your furniture or the bowl itself. Just ensure you read the customer reviews before you buy. 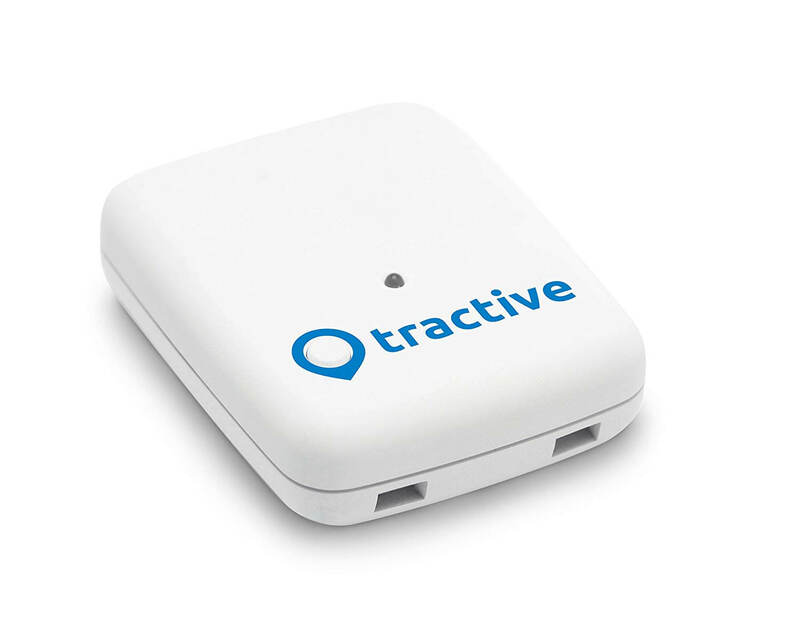 It will give you a handle on whether or not other dog owners found that the product was too complicated or difficult for their dogs. 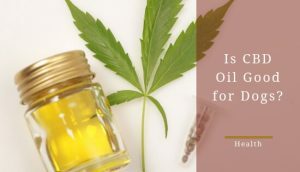 You also can't go too far wrong with any of the products suggested later in this article. This consideration is pretty obvious; however, it doesn’t mean we shouldn't make a note of it. Ensure the slow feeder bowl you’re buying can hold your dog’s daily serving. If it can’t, there’s no real point of even considering the bowl in the first place. Slow feeder bowls that are dishwasher safe will save you so much hassle, which is why I’d recommend refraining from buying any bowl that isn’t dishwasher approved. However, this capability does mean it’ll probably be a little more expensive. If you have a dishwasher, it’s worth it. I mean, nobody really likes hand-washing their dog’s food bowls and being dishwasher safe removes this rather unpleasant experience from your life. Plus, slow feeder bowls have a tendency to have some food left behind, which makes the hand-washing process even worse. The material of the bowl is entirely up to your personal preference. Typically, the material used is either going to be stainless steel, plastic, or ABS. I would opt for the stainless steel type of bowls as they’re less likely to end up needing a replacement. But ABS and plastic are just as good for the purpose; it doesn’t matter what material you pick as long as you’re sure it’s one of these three. A couple of materials poor-quality manufacturers might use that you shouldn’t under any circumstances be in the slow feeder bowls are PVC, phthalates, and BPA. Each of these materials is a harmful chemical that could cause a variety of problems for your staffy. A bowl with a non-skid base is an essential piece to the puzzle. It’ll help ensure your staffy doesn’t just tip the bowl over when they get too displeased with the new eating process. And believe me, they will try. After all, our staffies are very mischievous and smart breed. 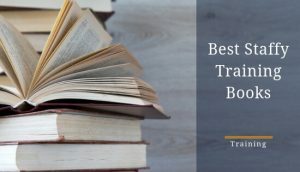 With all the necessary general knowledge out the way, we can move onto the reason all of you clicked on this article in the first place: the reviews. These reviews will give you an idea of what’s out there. Plus, they’ll help you see precisely what the bowl you’re looking for should look like and have the capabilities to do. The Buster Stainless Steel Slow feeder is an extraordinarily durable product that’ll keep your dog’s eating speed down to a reasonable level. If you end up buying this model, I’m fairly confident you won’t need a new dog bowl for a long time. You can view this bowl on Amazon here. This stainless steel masterpiece is my favorite product on this entire list. But like all my favorite things, it’s a little bit more expensive than I’d like; therefore, I’d need to about it a little before I end up splurging for this bowl. But if you have the money, there’s no reason this bowl shouldn’t be in your Amazon cart right now; unless you aren’t a fan of the stainless steel material. Other than personal preference and price, I couldn’t see a reason why you wouldn’t buy this slow feeder bowl. The H&S Slow Feeder Dog Bowl, would be a perfect buy for any staffy owner who has a pup that’s a little overeager. It has all the capabilities you’d hope to find in a high-quality slow feeder bowl and all at a price that’s very manageable. Click here to see this bowl on Amazon. Throughout all my research, I couldn’t find a single flaw about this product that couldn’t be account for by human error. I mean, it has everything you could ask for, and it has a design that’ll make it just challenging enough that your staffy will slow down their eating process without giving up entirely. All in all, this product's an incredible bowl that you’d be wise to consider for your staffy. Our last bowl, The Decyam Slow Feeder Dog Bowl, gives its customer an amount of choice the other products in this article don’t. It has nine different colours you can choose from, and I’m confident one those will fit your style. Plus, it has all the capabilities you otherwise look for in a slow feeder dog bowl! 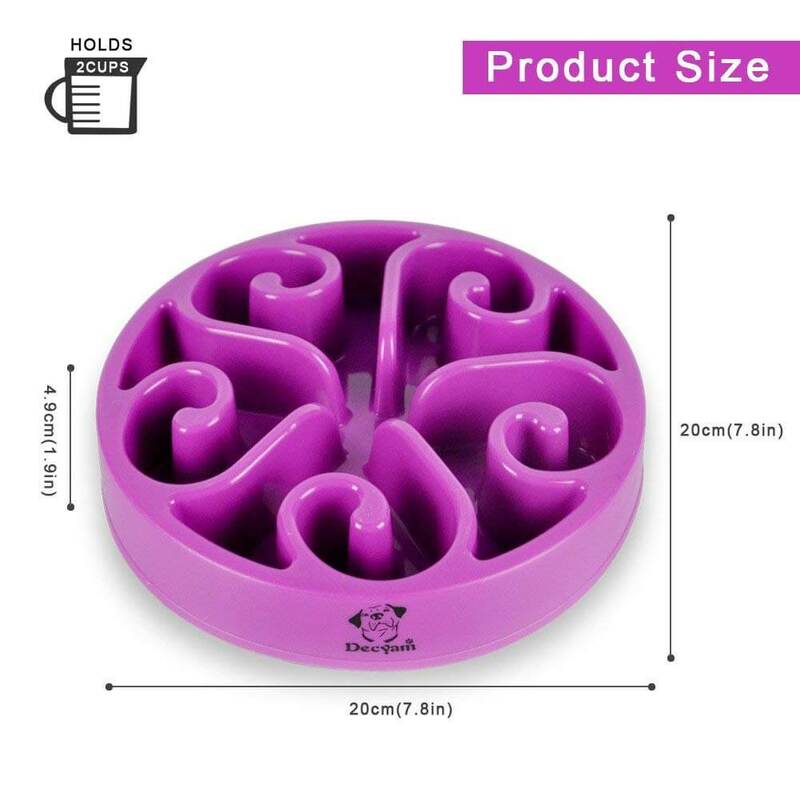 This particular dog bowl is an affordable, customer friendly model that has a very interesting looking design, is high-quality and offers little a customer could complain about it when it comes to the prodct itself. However, it’s essential we note that there were customers in the reviews section who did have an issue with how the bowl package showed up: torn, beat up, and other similar adjectives were used. But even with this potential issue, I still thought it was necessary to include it on our list. Honestly, everything else about this bowl is top-notch, and it’d be unwise not to consider at least buying it for your favorite staffy! There you have it, our three top picks for the best slow feeder dog bowls available. As mentioned earlier on, you really can't go wrong with either of the bowls in the list above. If I was pushed for my recommendation, it would probably have to be for the H&S bowl since it really didn't have any areas for complaint and is an excellent product that does the job. If you'd like to try the bowl for yourself, here it is on Amazon.